New Hampshire Roadside Viewing Guide, by Brent E. Scudder, 2013. 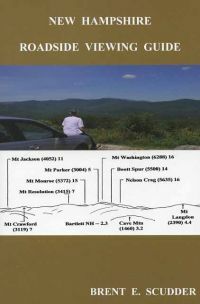 Modeled after Scudder's popular White Mountain Viewing Guide, this new book includes 152 panoramas identifying peaks and other landmarks that can be seen from roadside viewing area across the state, plus a few viewing spots in Maine, Massachusetts, Vermont and Quebec. Included are 16 summits that can be accessed by car, tram or chairlift. Includes classic vista points along the Kancamagus Highway and Bear Notch Road, and unsuual places such as the Wal-mart parking lot in Plymouth and the Waumbec golf course in Jefferson. 320 pp., 6" x 9."